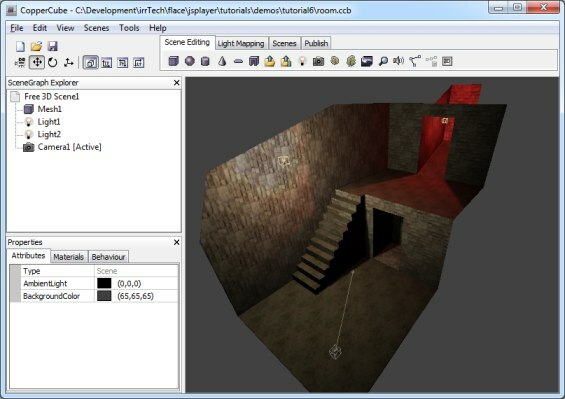 This tutorial demonstrates how to do collision detection in CopperLicht. A room where the user cannot move trough walls, and he can walk up stairs. In the zip archive of this tutorial, you'll find a .ccb file named room.ccb which contains exactly this example, you can also use this one. Look with the mouse, move with the cursor keys or WASD. Press space to 'shoot' a cube at the next wall. 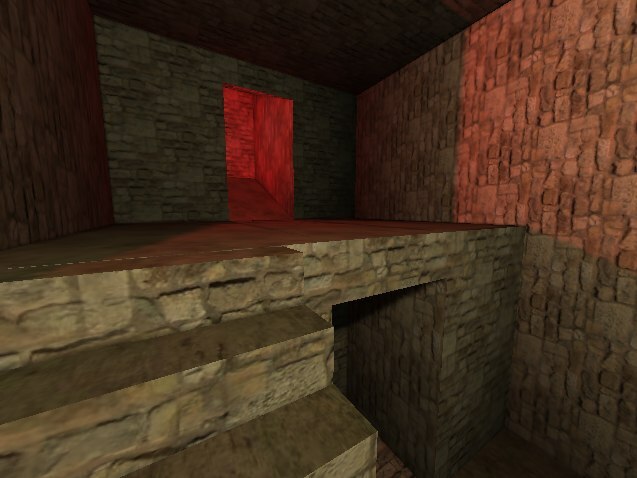 // in the CopperCube 3d editor, we already created a camera which collides against the wall in this scene. // a collision has been found. Also, put a .jpg file named 'ground_stone.jpg' into that directory, so that the cube will have a texture. Instead of scene.getCollisionGeometry(), we could have also supplied some other collision geometry represented as TriangleSelector. Triangle selectors in CopperLicht simply provide a way to access geometry. If you have a Mesh for example, you can create a new triangle selector using new MeshTriangleSelector(yourMesh, yourSceneNode);. If the mesh is big, you could use new OctTreeTriangleSelector(yourMesh, yourSceneNode) instead to speed up the collision queries a bit. CopperLicht automaticly provides a triangle selector for all geometry where the 'Collision' attribute was checked in the editor via scene.getCollisionGeometry(), so you won't have to build it yourself. Basically, we just added a function which causes a cube to be created at the point of the wall we are looking at when pressing SPACE. To find this collision point, we used the getCollisionPointWithLine() function of the TriangleSelector class. It returns the collision point as Vect3d or null if there was no collision. And that's it, now you know how to do basic collision detection in CopperLicht.